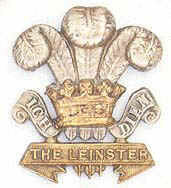 The insignia of the Regiment worn on Forage Caps between 1881 and 1922. Description: In silver, the Prince of Wales's Plume, the Coronet in gilding metal. Below the Coronet a scroll, in gilt or gilding metal, inscribed "The Leinster". Note: Users of Windows XP with SP2 will be advised that active script is blocked. To close the window just click your browser window icon on the top right of this window.